Free drinks, a bottle of Feni for the ‘Best Crawler’ and delicious chicken pois are just some of the things on offer at an upcoming Tavern Trail in Goa. Not to mention, you will also learn fun stuff about Panjim with your tipple. So the peeps behind Soul Travelling, the new outfit that is looking at making knowledge fun have just kicked off their Tavern Trails once a week, every week. So come every Friday, head to the G.P.O building in Panjim by 7.30pm and start off on their tavern trail. The trail starts and finishes at the same location, so you can leave your bike or car there. They do not tell you which pubs they will take you to in advance, so be prepared for the surprises. You get a drink at each pub, the cost of which is included in your entry fee of INR 750. 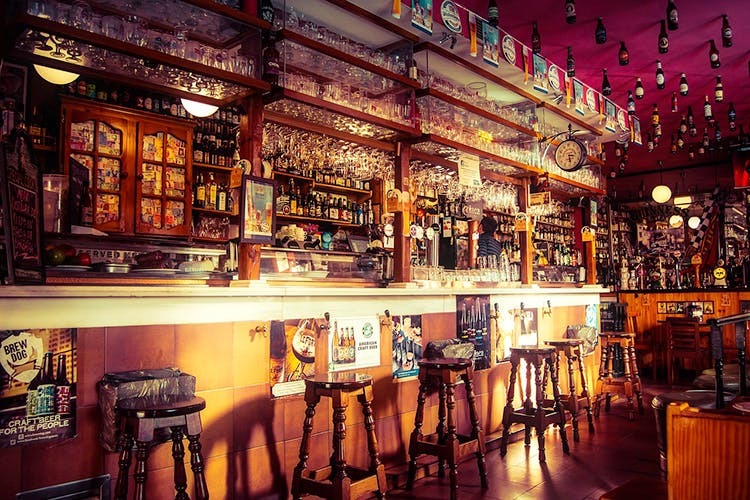 They usually cover about four to five pubs, but what makes this crawl interesting is that they share with you the history behind the pubs or the hotels they are housed in. So whether it was the macabre-like someone getting his fingers chopped, or an old home which set in motion Goa’s decision to stay independent from Maharashtra, you will learn it all. And whilst enjoying the company of strangers who just might become friends by the end of the night. You even learn some information on the historic sights in Panjim while you are walking from one pub to another. And then just to make things interesting, they will give you a clue, which had all of us scattering about to try and find the place and take a selfie to win that bottle of Feni. Not to mention the voting by us to self appoint the Best Pub Crawler for the night who wins another bottle too. They will provide a snack at one of the pubs and, of course, you could continue partying there once the trail is over. Ram & Varun who organize this activity are great fun themselves, and full of juicy tidbits about Goa and its history. Not to mention the tales of the exciting trips that they take to Europe which are all under INR 1 lac all-inclusive, and definitely tailored for those that hate group tours, but still want company while travelling. So we definitely recommend a Tavern Trail with these guys the next time you are in Goa. Besides every Friday, you could maybe even convince them to do a private one just for you and your friends. For more details or to book them check here.